It was only four years ago that I discovered that I am, in fact, a wee bit Irish! My great-grandmother, who died when my paternal grandfather was just sixteen years old , was named Mary Kathryn McNally. My grandfather loved her fiercely and my Aunt Ann told me that his mother’s passing would remain, for most of his years, the saddest day of his life. Saint Patrick’s Day took on new meaning once I realized I was part of the Irish clan. Of course, like most Americans I am my own walking Melting Pot: a Dash of Irish, a Sprinkle of Spanish, a dollop of English and who knows what other ingredients are mixing around in my gene pool? 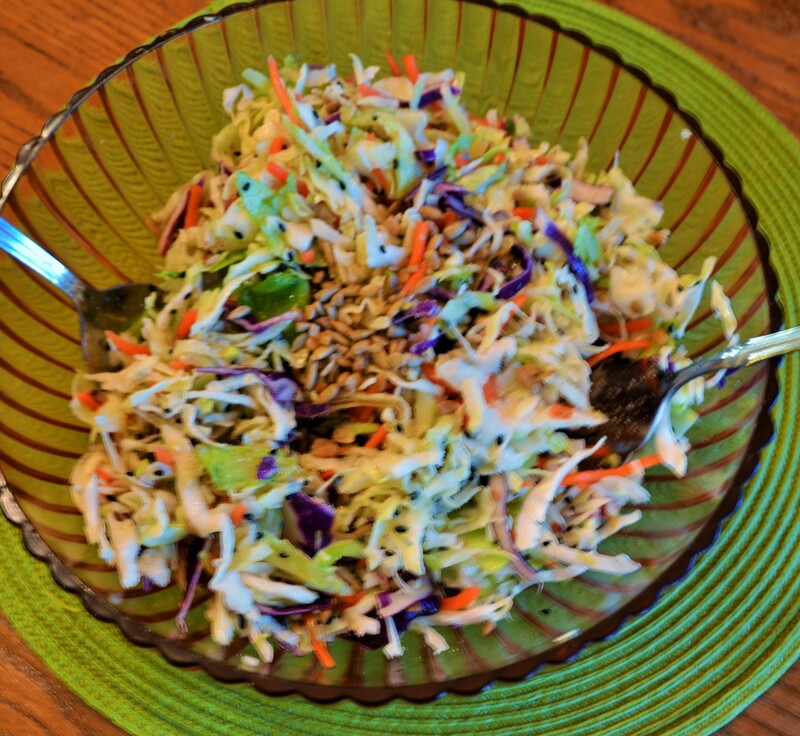 To celebrate diversity, I decided to share my recipe for an Irish-Asian-Cajun fusion slaw today. How’s that for eclectic? It’s base is shredded cabbage and carrots — a nod to the Irish. 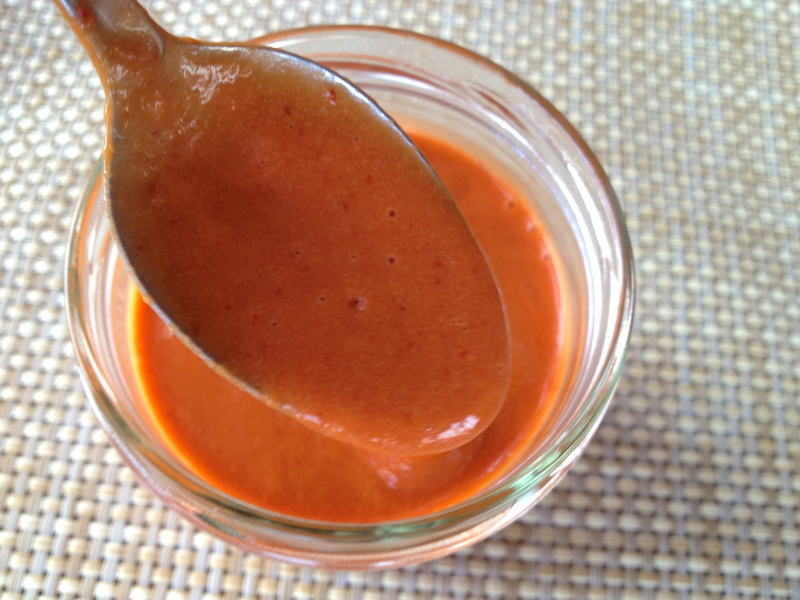 But it’s quickly marinated in an Asian-sesame dressing with hints of Cajun red pepper spice for added kick. My son popped in the other day, found a large bowl of this slaw in my fridge and ate nearly the whole thing! 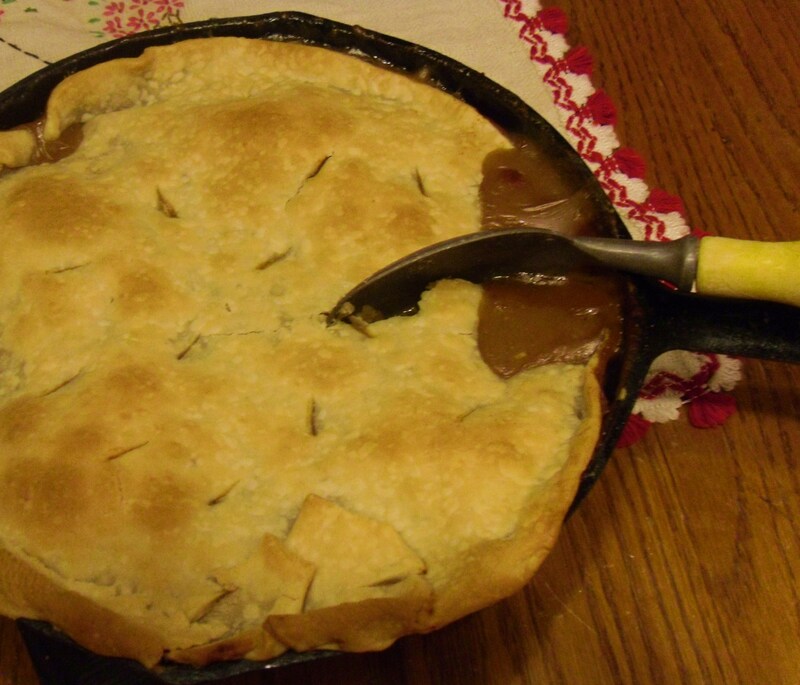 He loved it and asked for the recipe, a high compliment since he is a talented cook and foodie. This crunchy, refreshing slaw is a perfect Spring and Summer side-dish, a nice alternative to a lettuce salad and even easier to throw together. And now, an Irish blessin’ for all our beloved readers! May your hearth be warm, your holidays grand, and the Good Lord hold you in the palm of his hand. Whisk all the ingredients above, except for the coleslaw and almonds (or sunflower seeds). 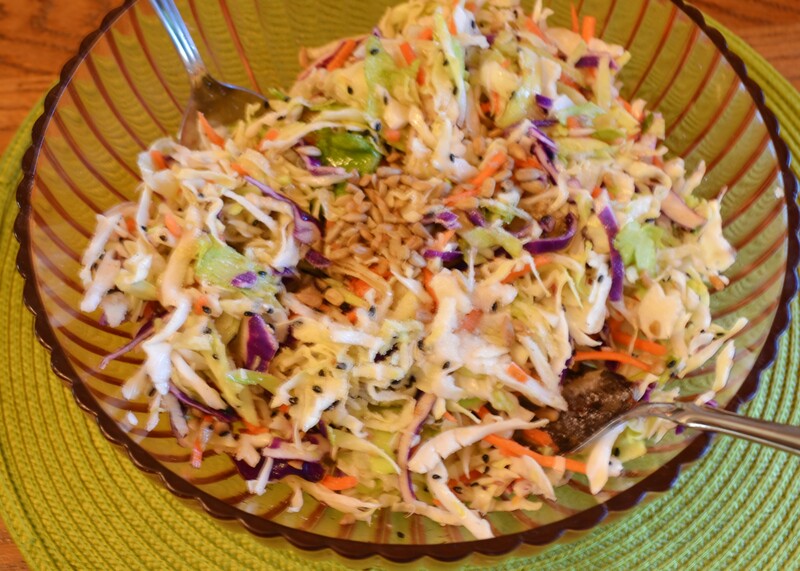 Pour over coleslaw in a big roomy bowl, and toss with tongs, turning until the dressing has coated the slaw. (The slaw will absorb the dressing and get a bit softer and juicier as it sits a few minutes). Just before serving, toss in the almonds or sunflower seeds. Check seasonings and add a few shakes of Tabasco if you want more heat. Store leftovers in an air tight container. 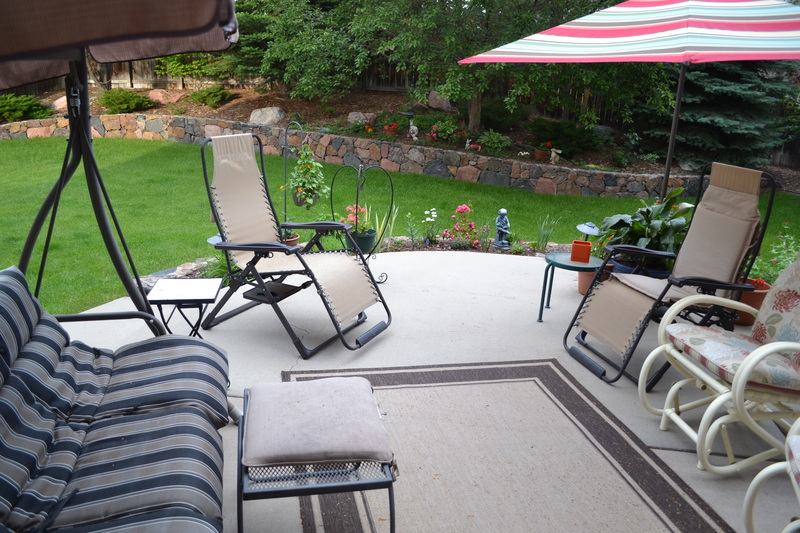 (Becky, the Mama) Now that summertime is here in Colorado, it is hard for me to stay away from the perfect weather on our inviting back porch! We nap, visit and eat outside as much as humanly possible. Yesterday, we hosted a group of young couples and little ones for an outdoor brunch. A friend dropped by last night and we enjoyed a plate of nachos and cool drinks as we rocked and swung and chatted in the evening breeze. Tonight we had some dear friends and their little girls over for an old-fashioned supper-on-the-porch that brought back memories of meals around my own grandmother’s table. I made garlic & lemon roast chicken, baked sweet potatoes, Asian peanut buttery green beans (recipe to come soon! ), corn, and my simple rustic, pastry-style cherry-blueberry cobbler (a festive July 4 recipe, by the way, with a little scoop of vanilla ice cream and raspberrg sorbet). 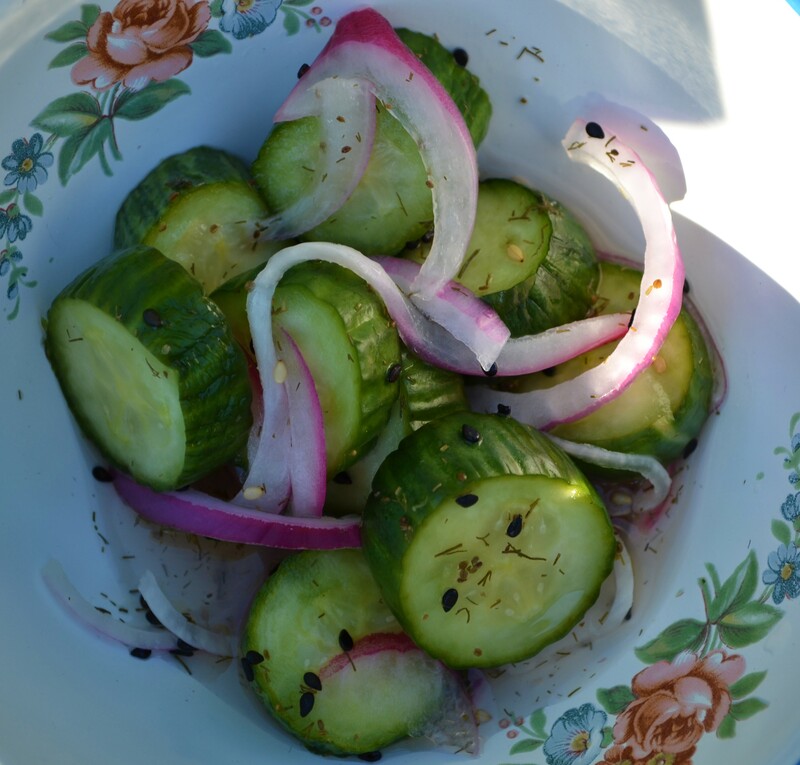 But it was the refreshing side-dish that I prepared for tonight’s meal that made me wax nostalgic for potlucks and picnic tables of my childhood: sweet n’ sour refrigerator pickled cucumbers & onions. I updated this beloved Grandma dish by using the small Asian or Persian cucumbers that are often sold in little packages of six to twelve, and becoming increasingly popular in grocery stores everywhere. Sliced a little on the thick side they hold their crunch for days in this pickling liquid. 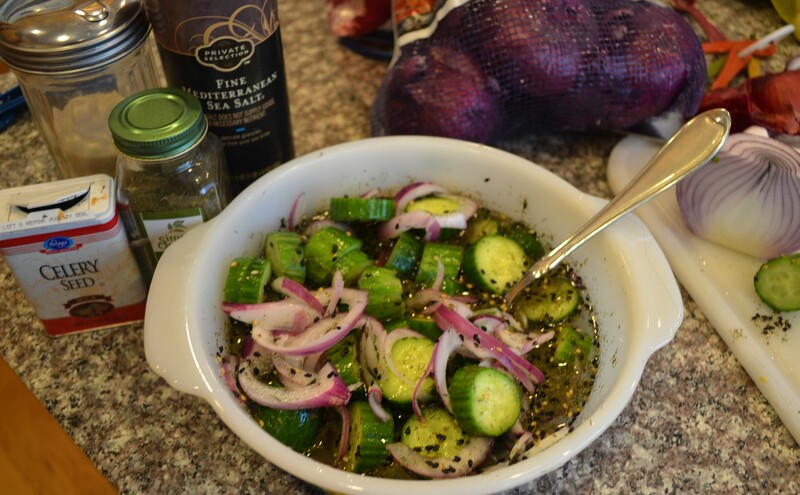 I like to keep a container of these marinated cucumbers and onions hand in the fridge all summer long to add a crisp, cold delightful punch to almost any meal. You can get creative and add some diced fresh tomatoes, olives, artichoke hearts or any kind of cooked beans and a handful of fresh chopped herbs to this basic dish to create a quick, pretty, refreshing marinated salad for potlucks, picnics and summertime side-dishes. Crunch on and enjoy! Directions: Mix all of the above together in a dish with a lid. Let the mixture sit on the counter , with lid on top, at room temperature for about an hour and then put in fridge to chill until ready to serve. (Let the veggies marinate at least 3 hours for the best flavor through-out.) Will keep in fridge up to a week, maintaining its crunch. (Becky, the Mama) You know those times when you want “just a little somethin’-somethin’’” to tide you over to until the next meal, or give your foggy brain an energy boost? Something good for you, tasty, without lots of calories or carbs? But you want more than a few carrot or celery sticks. Or maybe you want a light lunch in a hurry, but you aren’t crazy about the idea of sandwiches or wraps with all that bread? 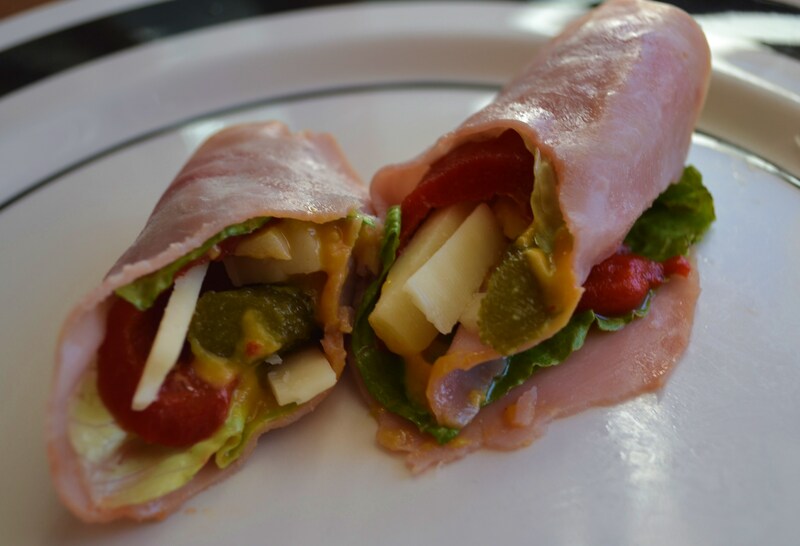 Here’s my favorite pick-me-up-in-a-hurry snack and it is less than 100 calories per Skinny Roll Up. No carbs. No gluten (as long as the meat and cheese you use is gluten free.) 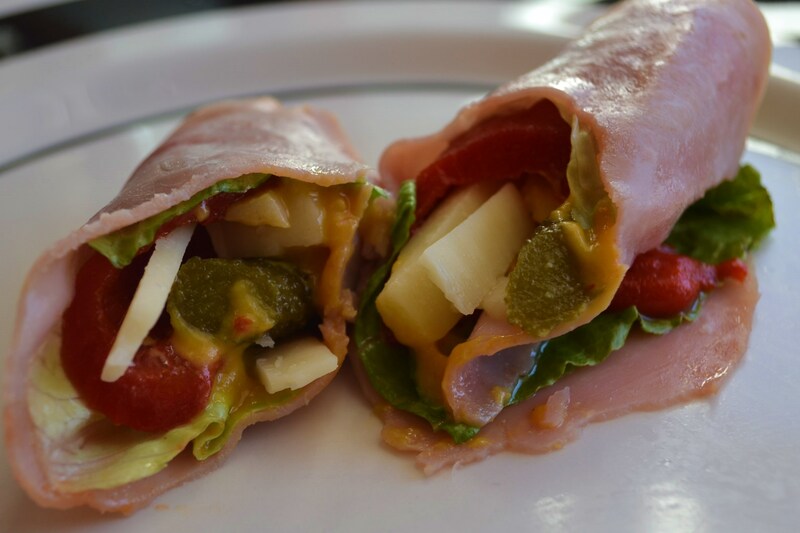 Plus there are a thousand variations to this basic “recipe”: you can choose whatever thinly sliced sandwich meat you like (or substitute a vegan version), then chose a small bit of cheese (your choice, or leave it out), whatever veggies you have on hand (cooked or raw or a combination), and any sauce that floats your Roll Up Boat from honey mustard (as I used here), to a little dollop of Ranch Dressing with Buffalo Sauce, to Teriyaki Sauce with Sriracha, to Bar-b-que sauce… and on and on. They are surprisingly filling, two of them with a piece of fruit works as a great light lunch, and the calories are such that you can enjoy another snack or small dessert with a cup of tea or coffee at mid-day and not break your calorie bank. Vegetarian or Vegans can substitute ToFurky Roasted Deli Slices, which have excellent taster reviews. Or skip the meat layer, use a large soft piece of lettuce instead, and spread the lettuce with humus or refried beans for the protein. 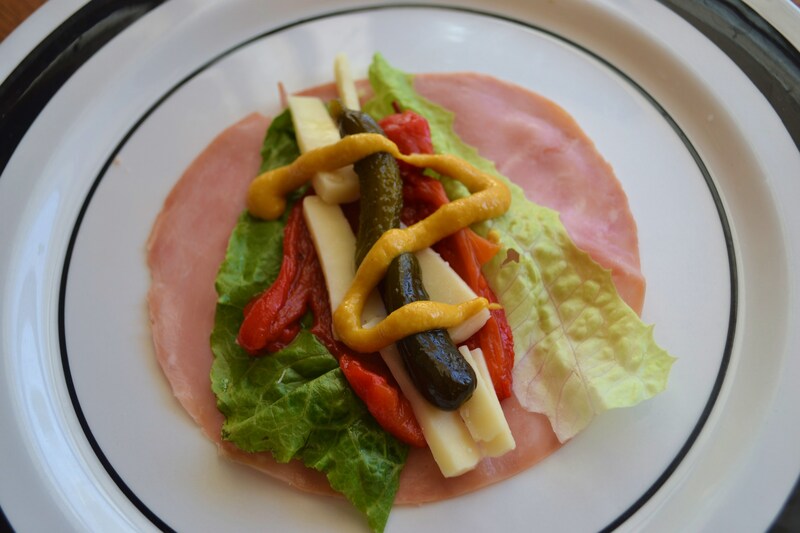 I used thin deli Honey Ham, a slice of Romaine, a slice of Roasted Red Pepper, some white cheddar cheese strips, sweet pickles and honey mustard. Yummmm…. 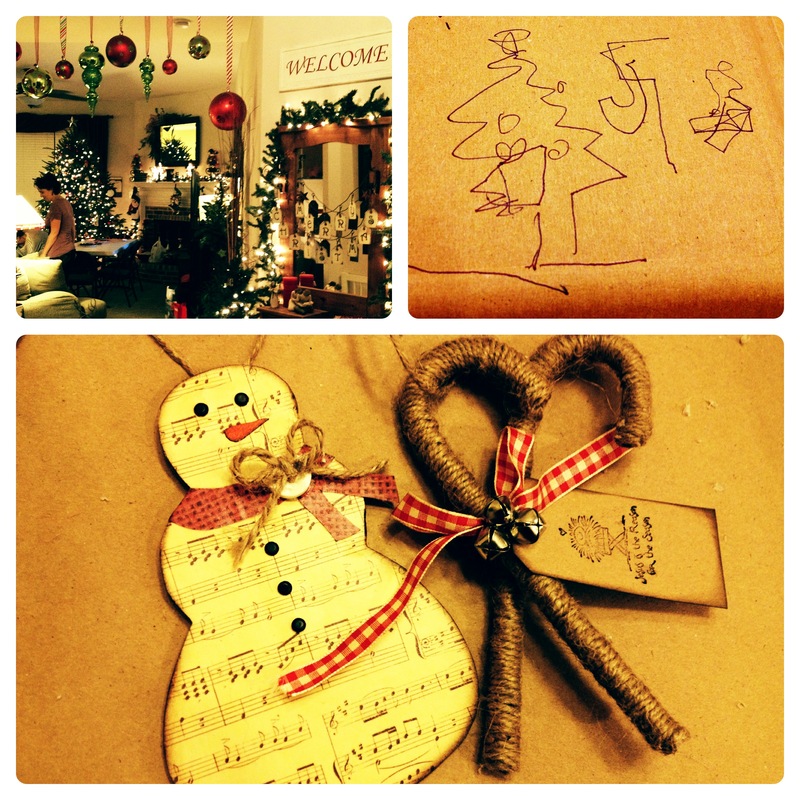 I’ve been mulling over this year’s Christmas Dinner Menu for our big blended family. My goal is always to use recipes that are delicious, tasty, and pretty — but are no-brainers to make and serve. For the main dishes, I decided on my never0fail, always juicy slices of Tri-Tip roast in au jus; and a nice center cut of grilled Norwegian salmon from Whole Foods, our favorite cut of fish. This should please the beef eaters and the fish eaters alike. I recently discovered some delicate, amazing-tasting fresh “pasta purses” stuffed with cheeses and truffles at, of all places, Sam’s Club. After cooking them in boiling water, I gently ladled them into a quick rich sauce made of cream, a little garlic, Parmesan cheese and basil. To. Die. For. And silly easy. I now have my perfect fancy-but-simple Christmas side dish to put on the menu. Finally, to add some freshness and crunch to round out the meal, I thought I’d make a salad. But I didn’t want an old boring salad. Then – faster than a speeding reindeer it came to me! I’d make a Christmas Wreath Salad. I’d arrange the greens on a plate like a wreath, dot it with red berries, both fresh and dried, sprinkle with nuts and top with feta cheese “snow” and tuck a bow at the bottom of the plate. 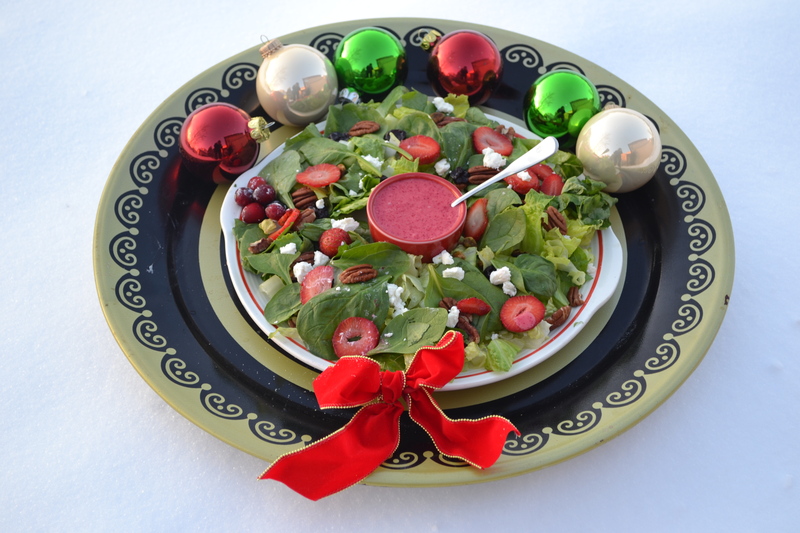 Then, what could be more festive to drizzle on this pretty salad than a vinaigrette inspired by my favorite cranberry-orange relish? As I write this, it seems the whole country is blanketed with snow and ice. Here in Denver it is a balmly… 1 degree. Our front yard proved to be the perfect place to chill the salad and snap some photos. Let me assure, I didn’t dawdle with the camera outside for long. In fact this was probably the fastest — and coldest – food photography session I’ve ever done. Greg and I sampled this trial-run salad as a one bowl supper tonight by topping it with some warm, sliced deli roast chicken. Big, Holly Jolly win. 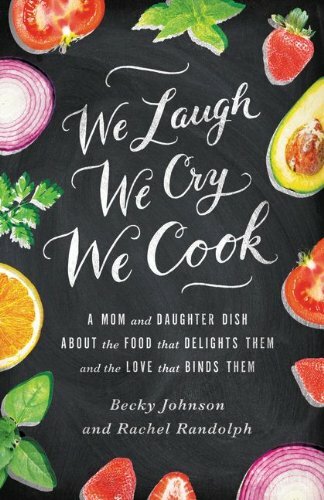 By the way, if you are looking for an uplifting, fun gift for teachers, girlfriends, moms, grandmas or cooks in your family … may we suggest copies of We Laugh, We Cry, We Cook? Our memoir is truly one of those perfect, generic, happy gifts that anyone on your list will enjoy. The recipes at the end of each chapter add extra value. The book is available online everywhere, and in most bookstores; but if you would like an autographed, wrapped copy check out Rachel’s last blog post with instructions on how to contact us. On a large round plate, put a small bowl for the salad dressing in the middle. 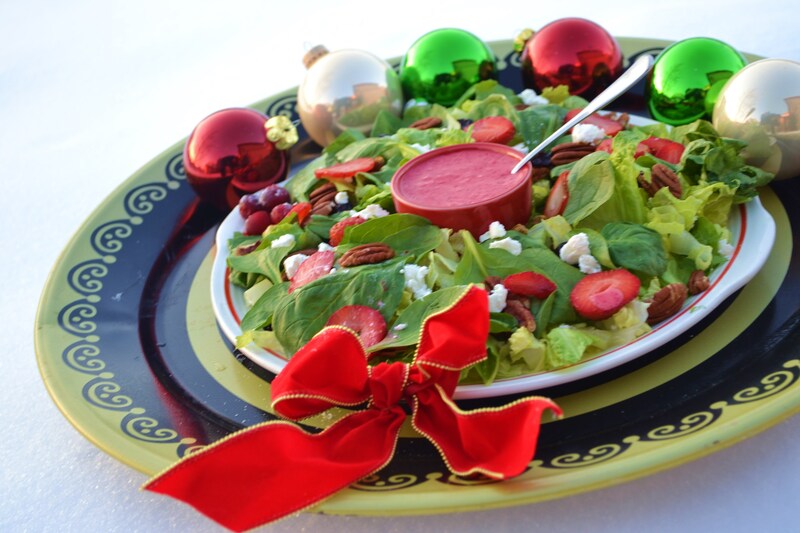 Arrange salad greens around the bowl to make a “wreath”, then dot the wreath with nuts, dried berries and fresh betters. Finally sprinkle with feta “snow”. 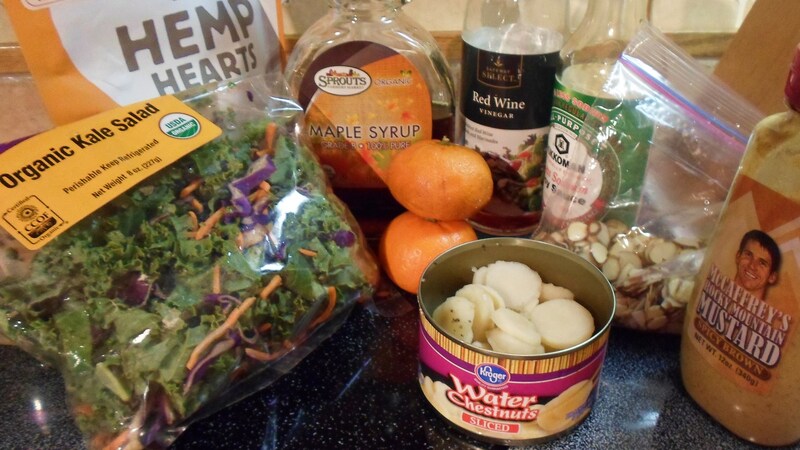 Fill the bowl in the middle with the following vinaigrette and serve chilled. Put all ingredients into a blender or food processor and process until smooth, and turns a gorgeous raspberry red. Keep in fridge until ready to serve. The other day while I was, ahem, procrastinating on doing some actual writing, I decided to organize my Pinterest boards. Obviously, that is a priority two weeks shy of a deadline. 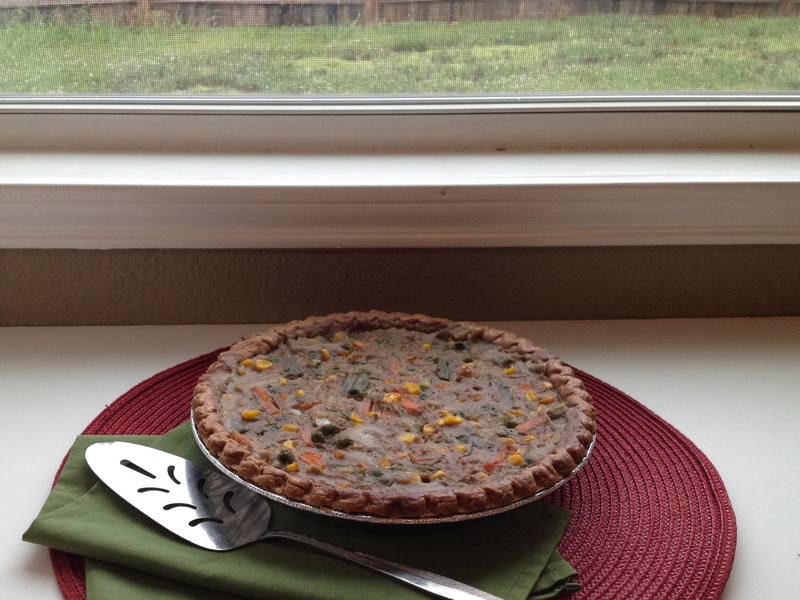 And while I was at it, I made a Vegan Thanksgiving Pinterest Board with all the recipes I have made or posted that would make lovely vegan dishes at Thanksgiving. Most are mine, some are moms, and a few are from some of my other favorite blogs. I thought, in the midst of the final edits and recipe testing for the book and what not, instead of creating something new for my post this week, I’d round up some of our favorite recipes from this blog for Thanksgiving. Most are either vegan or can be easily made vegan with a few modifications, some are gluten-free, and a few are neither. As a vegan myself and friend to many people with dairy, gluten, and even poultry allergies, I hope this list will give others with different eating habits some ideas for Thanksgiving dinner. I also hope it will be helpful to those who are cooking for people like me this Thanksgiving. Serving one or two special dishes for the “weird” eaters in your life is a way to show how much you love and care for them and to let them know you honor and respect their food choices. Believe me, it means more than you can know to arrive at someone’s home and realize they thought of you while planning their menu. It means they think you matter and want you to feel included at the family table. One yummy dish can say all that. Jared, Jackson, and I will be heading to Colorado to spend Thanksgiving with Mom and Greg and to celebrate turning in our book. Whoohoo! It’s always a fun time when we get together. We laugh. If we’re lucky, we might even laugh until we cry. And of course, we cook! 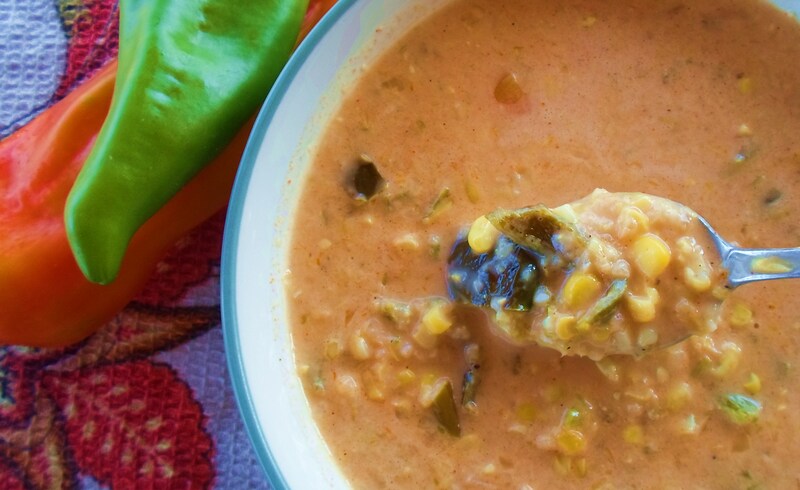 Would be great with shredded Turkey or Chicken, crumbled tempeh, or Chik’n Strips. 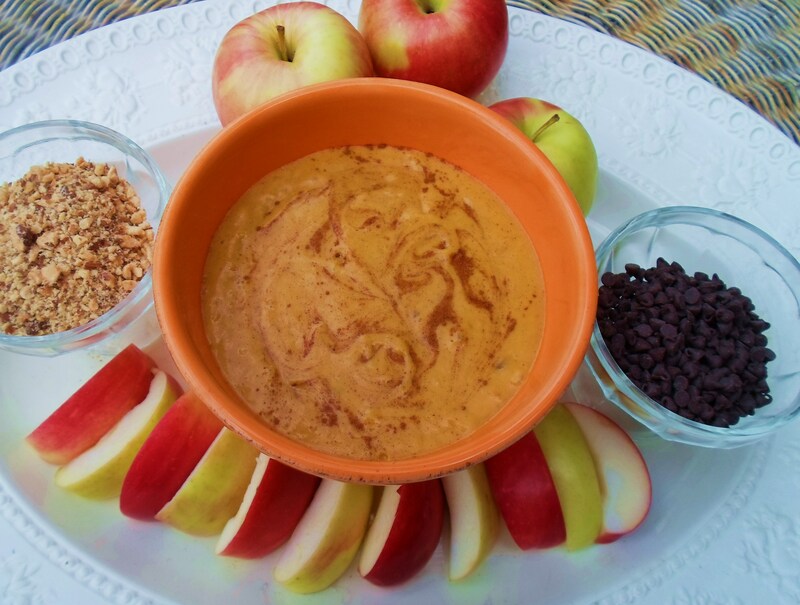 If you are looking for something a little less traditional, this is one of our favorite fall dishes. 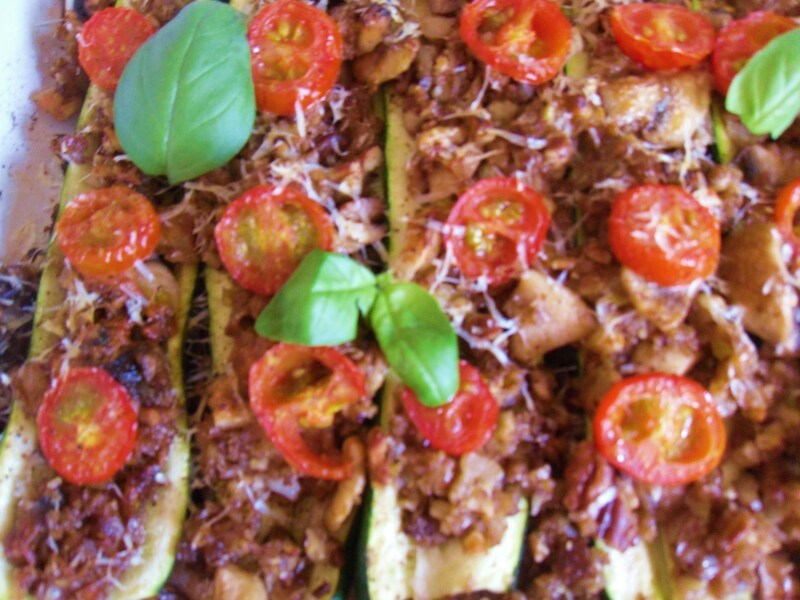 It would make a delicious alternative for vegan or vegetarian guests. Adding a little Field Roast Applewood Sausage makes this a filling entree. Another one of our fall favorites. 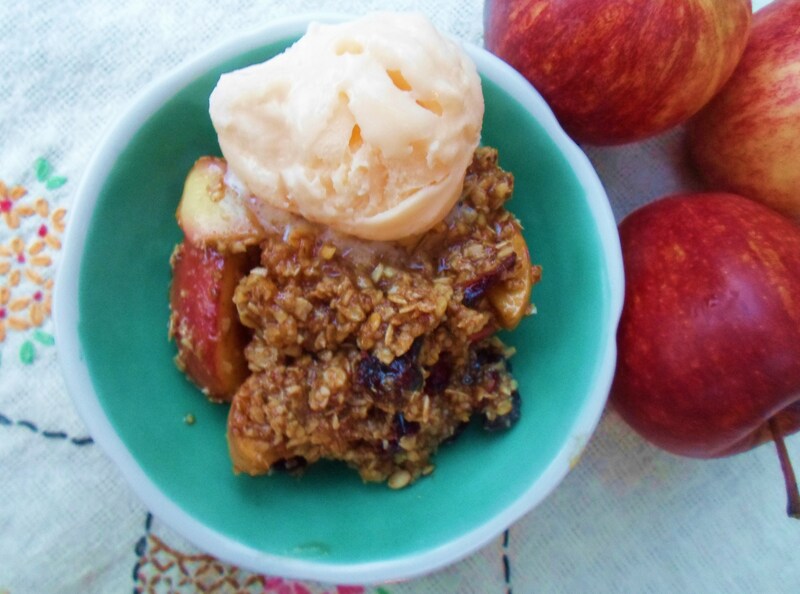 I make variations of this at least every few weeks in the cooler months. 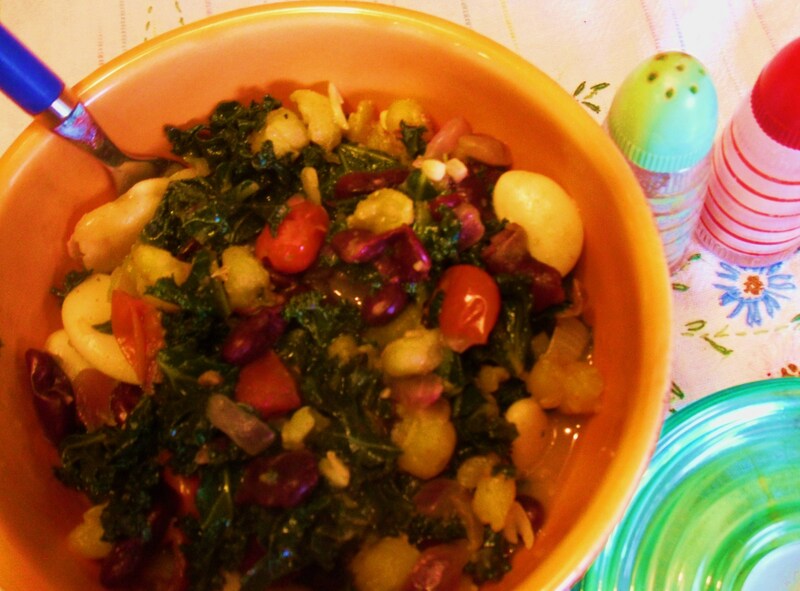 It is filling and nutritious and has lots of bright pretty colors. 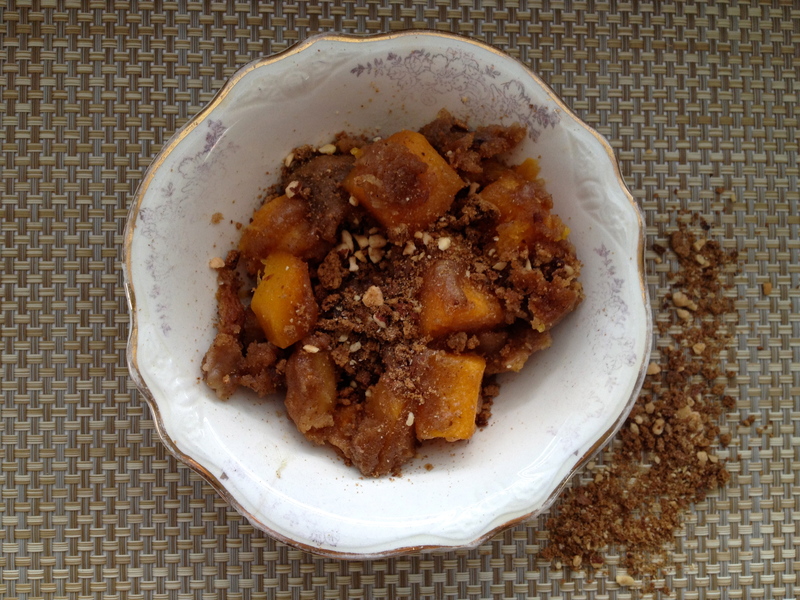 Sometimes I add diced butternut squash for even more fall flavor. It simmers in one pan in less than 30 minutes and can easily be re-heated, so it makes a great alternate meal for vegans at the table without taking up much extra time or kitchen space. 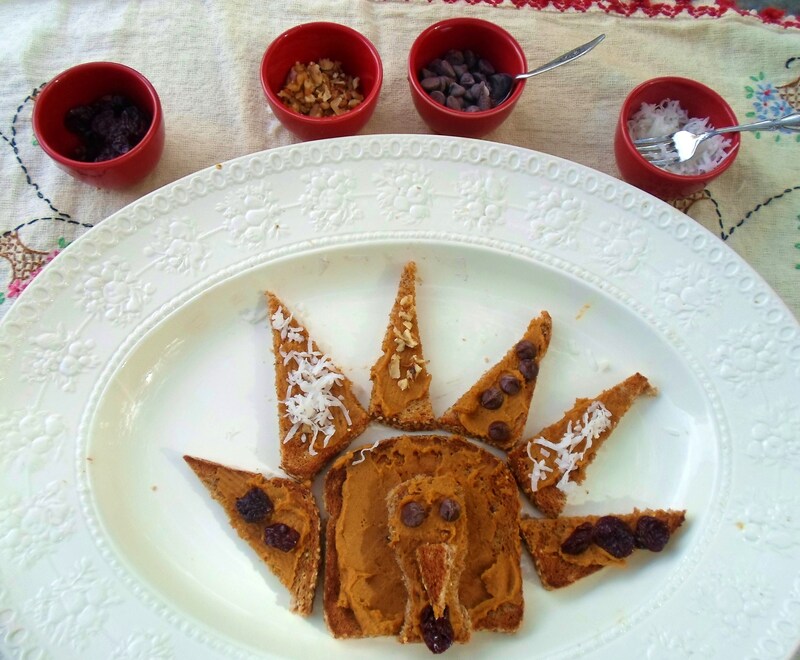 Hold your little ones over until dinner and entertain them at the same time by letting them decorate their own Gobble-Gobble Turkey Toasts with Pumpkin Butter and a variety of toppings like chocolate chips, shredded coconut, walnuts, and dried cranberries. This is a fun way for vegans to incorporate turkeys into their child’s Thanksgiving experience. 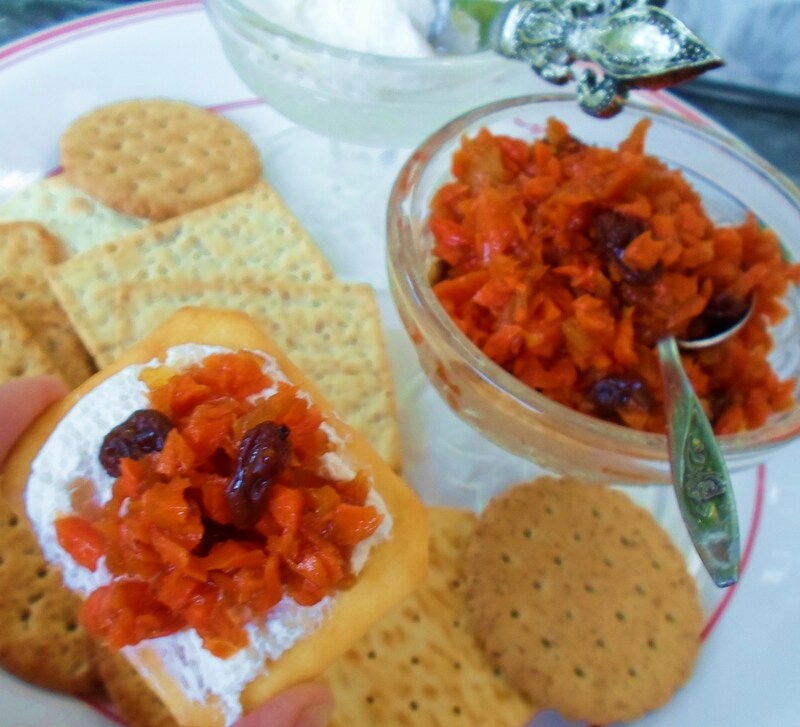 These appetizers or snacks are so quick and easy, any one of your kitchen helpers could make them. They are melt-in-your mouth delicious when warm, but still great when they cool to room temperature, making them easy to make ahead and just leave out for the grazers. They also provide quick energy for a busy cook. This stuff is amazing on crackers, but also a fun carrot cake “mix-in” for yogurt or ice cream. An easy and unique treat to serve at your next party or bring to a hostess. Non-vegans love this dish too and are always shocked when they find out there is no cream or cheese. 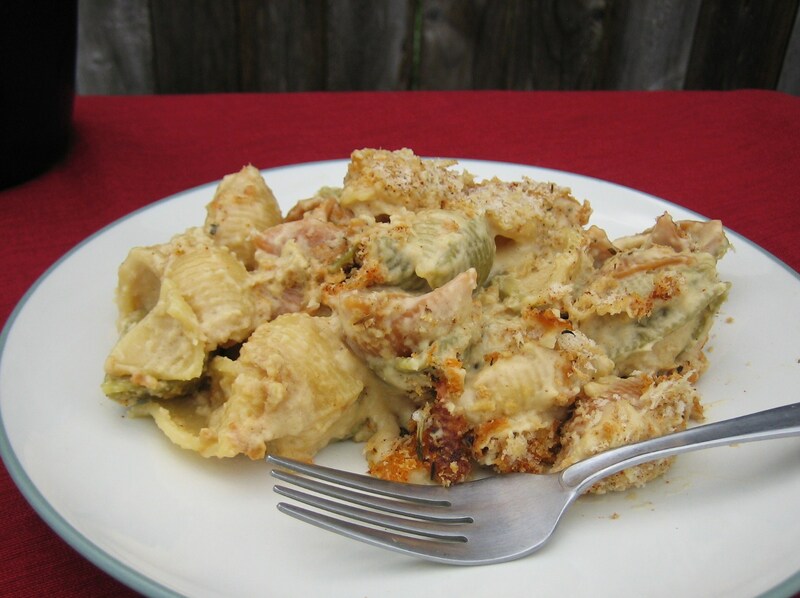 Compared to real mac & cheese, this is more like a creamy pasta casserole. With the addition of some chickpeas, I often serve it as an entree. We probably need to retake these pics. It looks much prettier than the picture shows and it tastes amazing. My mom made this for me and I made her promise me she didn’t sneak meat in it. The walnuts really transform into a meaty texture. We both love this dish. 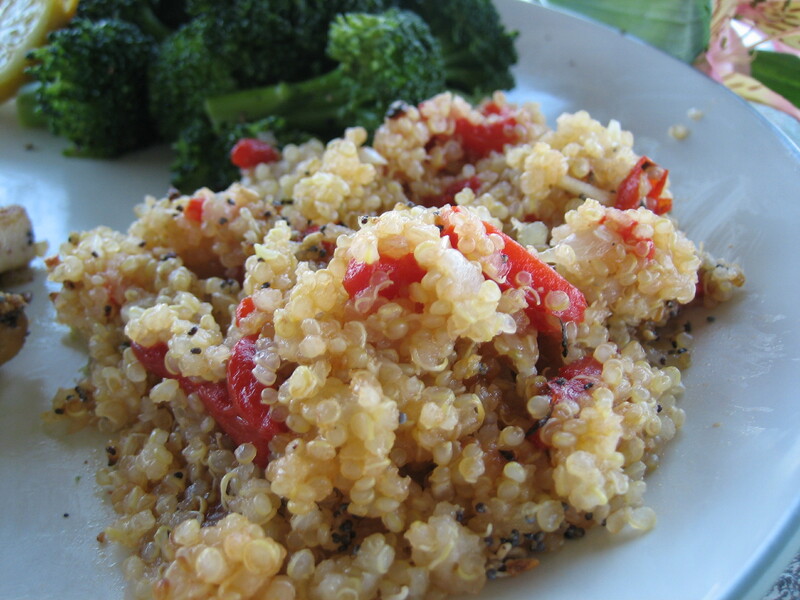 This is my go-to quinoa recipe. It’s so easy and with a rice maker, it basically cooks itself while you get the rest of dinner made. 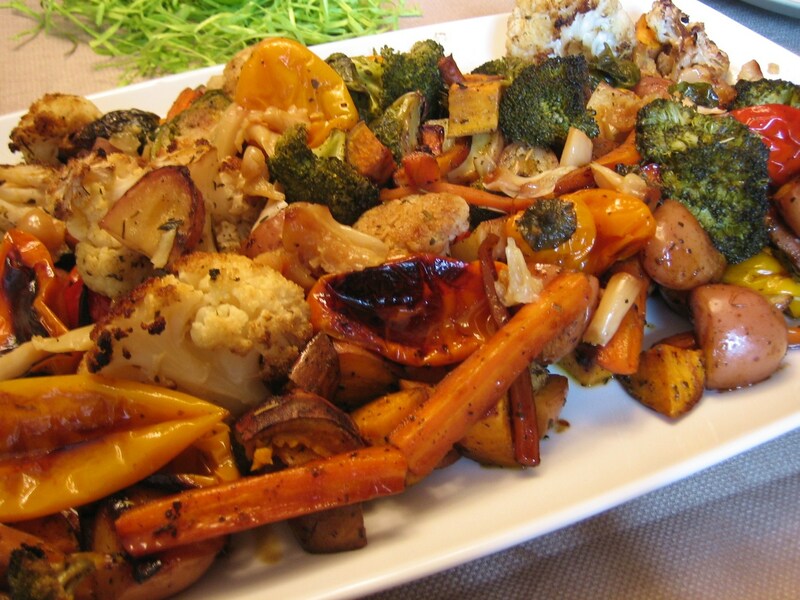 Roasted veggies are delicious on any occasion and even the pickiest veggie eaters often find they like vegetables that have gotten crisp and sweet in the oven. Sweet, buttery orange glazed carrots are the perfect compliment to any Thanksgiving dinner. 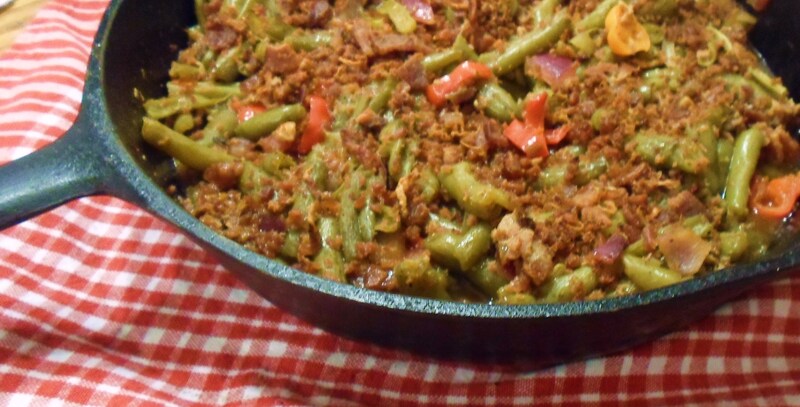 A nice alternative to the traditional Green Bean Casserole at Thanksgiving. 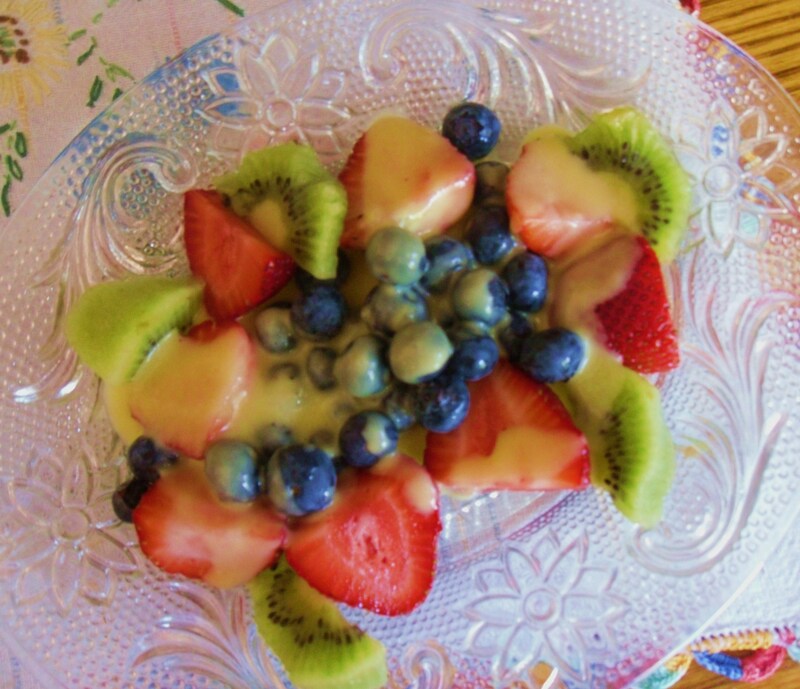 Perhaps the best fruit salad dressing we’ve ever tasted. This easy delicious two ingredient recipe will be your new favorite topping for everyday and holiday fruit salads. We promise you we’re not exaggerating. 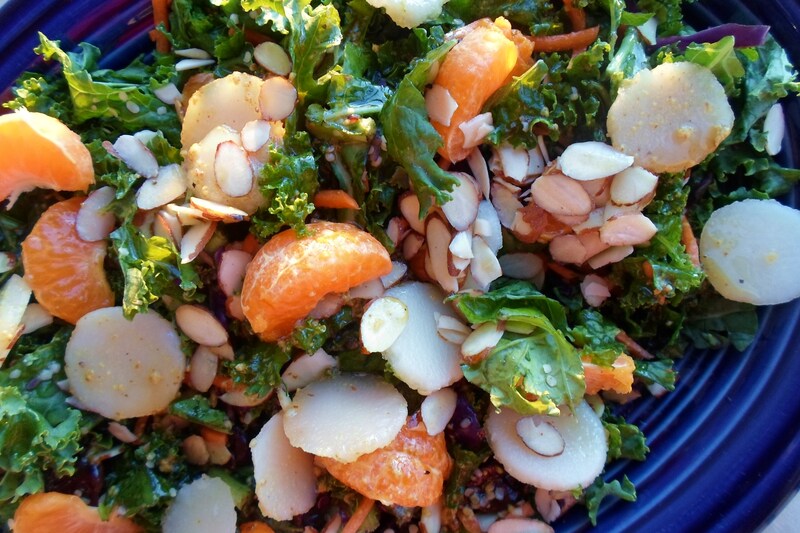 This sweet orange marmalade dressing goes perfectly with massaged kale greens, dried cranberries, and slivered almonds. 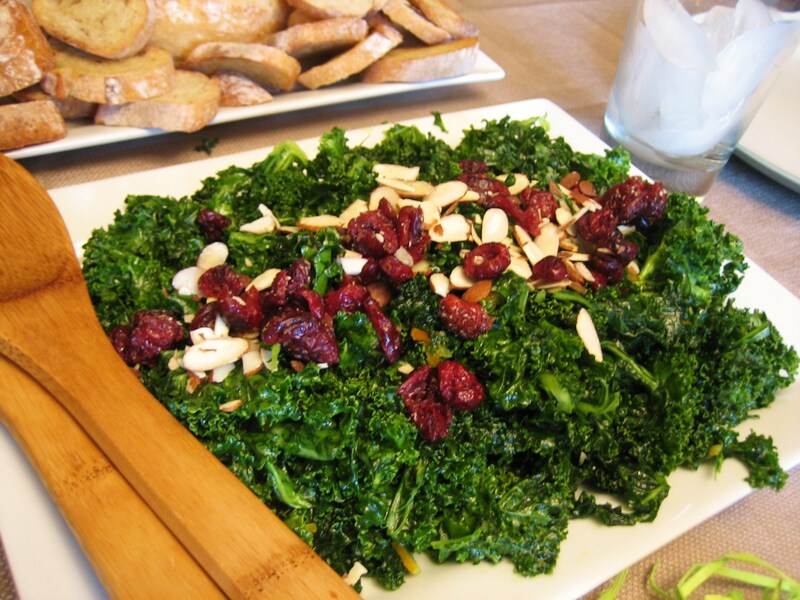 Kale is a great green for serving at dinner parties or holidays because it holds up well in dressing. In fact, you can dress this the day before and it will only taste better the next day. Just pull it out of the fridge, and sprinkle with toppings. 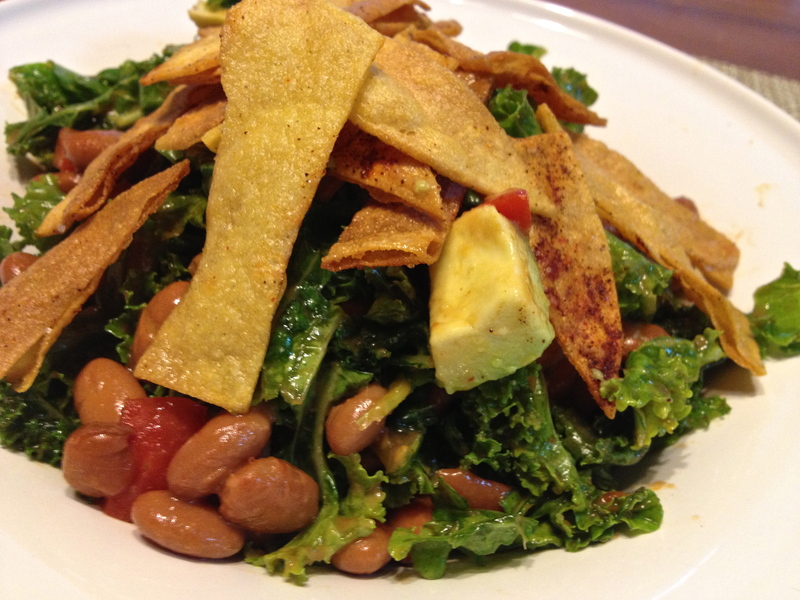 Another yummy kale salad option. This one is packed with lots of nuts and seeds, making it a nice filling salad for those who may skip out on the turkey or for your health conscious dinner guests. Coconut has become a best friend in the Laugh, Cry, Cook kitchens. Even though my mom eats dairy, she too is hooked on the wonders of the cold cream from a full-fat coconut milk. 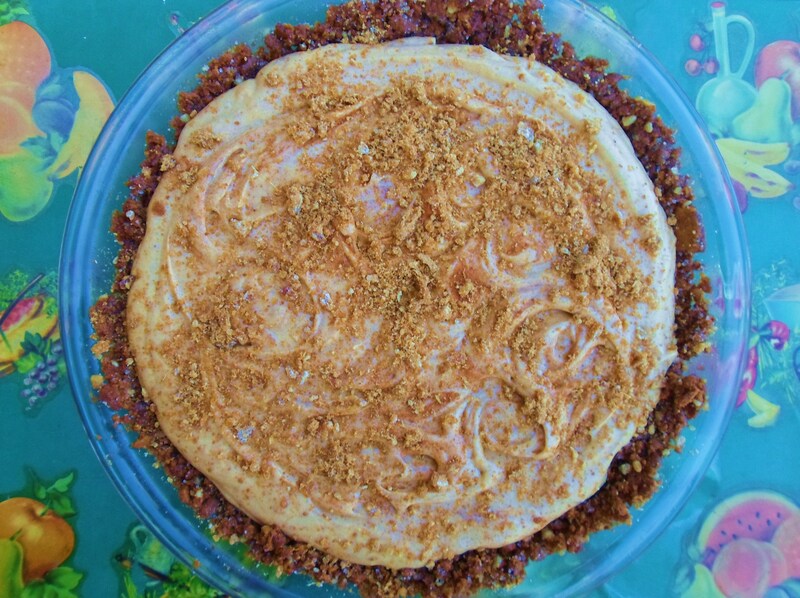 Whip it into a whipped cream topping, use it for a yummy pumpkin pie dip (see the snacks and apps), and even make this Luscious Pumpkin Mousse Pie with it. Don’t even bother telling the guests it’s vegan…they will NEVER know. We think it may be the best pumpkin pie either of us have ever had. A grown-up autumn twist on an old easy summer favorite that called for a can of peaches and a yellow cake mix. This version uses butternut squash and pumpkin spice bread mix instead. Buttery, not-too-sweet, crunchy and rustic. 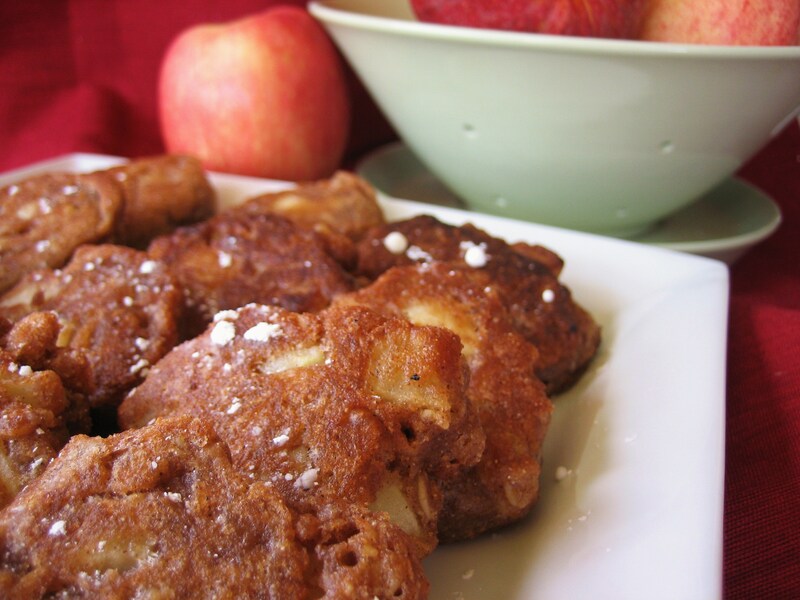 It has no refined sugars, but is made with natural coconut sugar and tad of pure maple syrup. 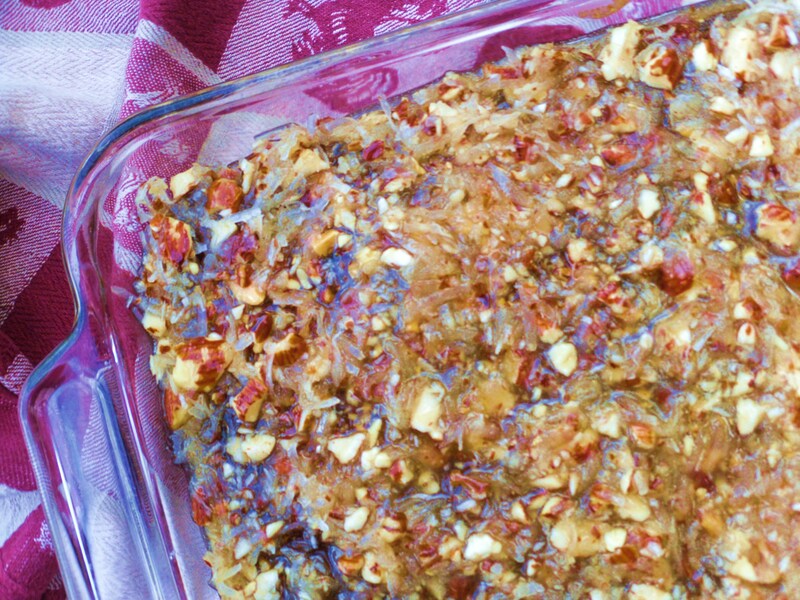 The topping has no flour: it is all oats and nuts and seeds, giving it a fabulous crunchy texture. It is loaded with fiber and protein, a comforting autumn dessert, and healthy enough to serve the next day for fruit-nut breakfast oatmeal – re-heated and served with a little milk, cream or almond milk. We have so many yummy desserts, but this post is getting super long, so I’ve just linked to a few more worth checking out. Yes, breakfast is still the most important meal of the day…even on Thanksgiving. No one wants the cook to pass out from low blood sugar levels in the middle of prepping dinner. 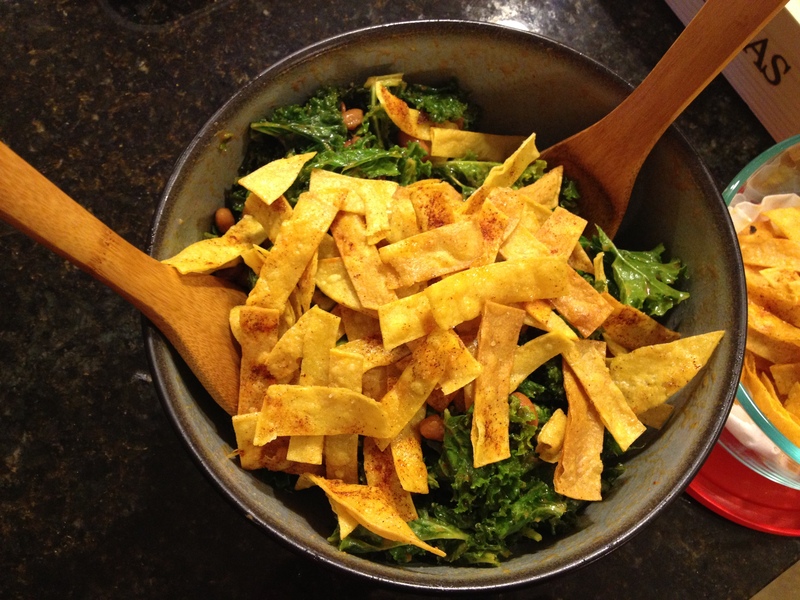 Some of your favorite dishes can be easily modified for a vegan guest if you just know a few tricks. Eggs: 1 T. of flax meal mixed with 3 T. of warm water will gel up in a few minutes and can be used as an egg substitute in most baked goods. 1/2 a banana also usually works in sweet breads or muffins. Butter: Earth Balance is a delicious vegan butter substitute. In fact, if you already use margarine, you’ll hardly notice a difference int the taste. It is readily available at Whole Foods and Krogers here. My small town Wal-Mart even started carrying it. Milk: Unsweetened almond milk is my favorite substitute for most of my cooking. 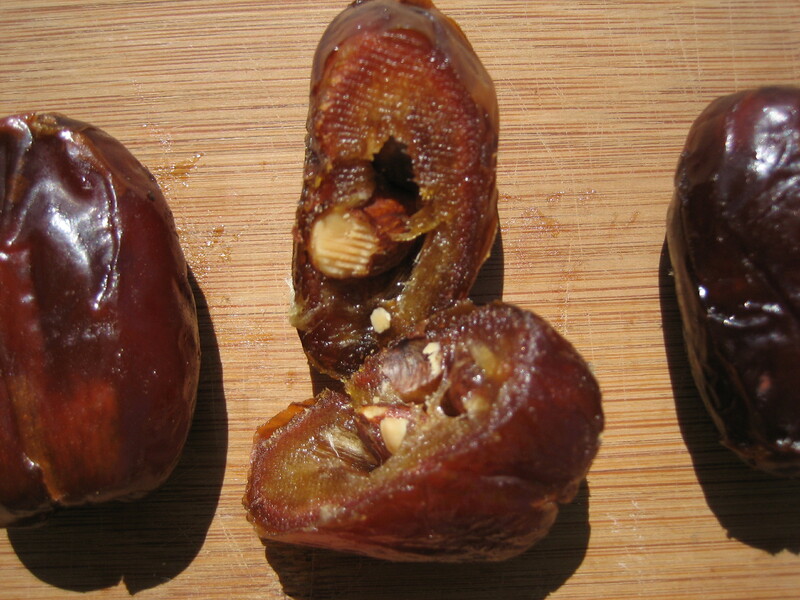 It has a very mild taste so it doesn’t overpower a dish. Soy milk seems to have the best results for baking cakes and cupcakes though I usually use almond milk anyway because it’s what I have on hand. Meat: Don’t assume that the vegans in your life will be thrilled with a fake chicken breast as their main entree. Some will, but many of us, especially the ones who technically try to follow a plant-based diet, don’t actually eat many of those processed fake products. 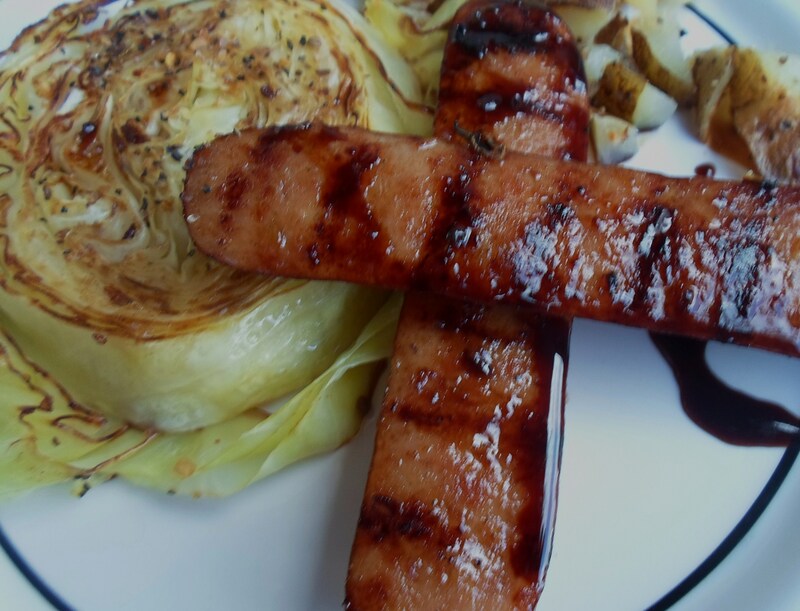 I have found a few that I like: Field Roast Applewood Sausages are my favorite meat substitute. They are GMO and soy-free and taste delicious. I’ve used the Chick’n Strips a few times too and those are pretty good on a pizza or something. Whole Foods has a Chick’n Salad in their deli that is quite good. I like cooking with tofu, but it’s taken me some time to learn how to make it taste good. 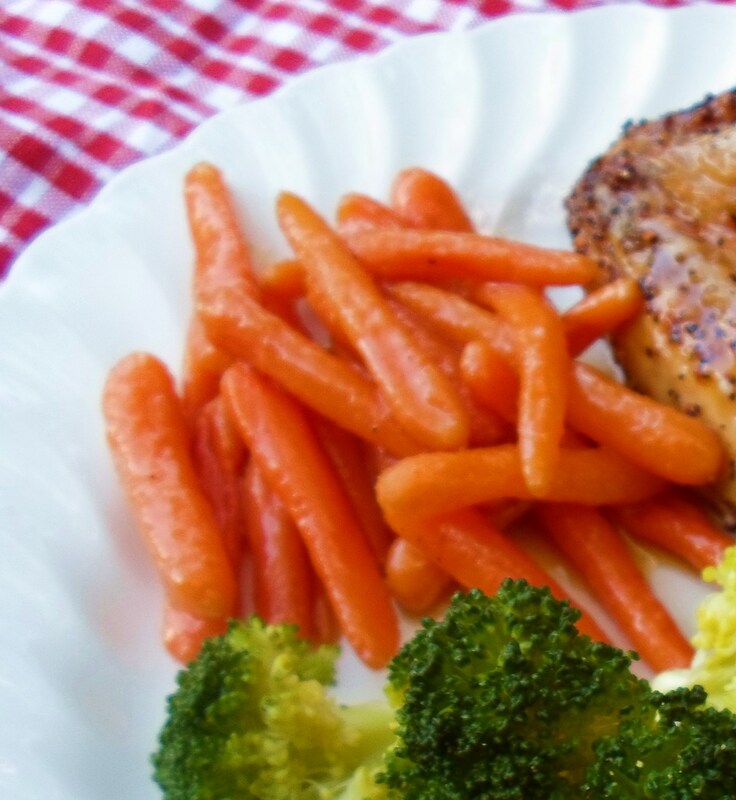 Really, you don’t need fake meat or even soy to have a filling meal. Lentils, split-peas, chickpeas, and beans are all healthy filling options and can easily replace the meat in a lot of recipes. I hope you find this helpful as you prepare a Thanksgiving meal that includes all the different palates in your family at one table. May the food join your family together in love and respect for one another. May we all honor each other and our differences on this day of gratitude and thanks. Greg and I just spent two days on a road trip, driving from snow-covered Denver to the blue skies, hot air balloons, rusty-red mountains, green grass, gorgeous flowers and warm sun of Arizona. As soon as we pulled into the parking lot, I grabbed my bathing suit from the suitcase (still in the car) ran into the condo and threw it on, then dashed to the swimming pool. The sun was still in the sky, but sinking, so I arranged my lounge chair just so, where I could get the maximum rays, then sat down and basked and beamed with happiness. For as long as I can remember I’ve been a sun and a water baby. I wore my dark hair in two braids, as a little girl, and by summer’s end I always looked like Pocahontas, my skin as “brown as a berry,” my mother said. To this day, I wonder if I am part Indian, as I disdain shoes and socks, preferring to be bare foot, even in the winter. I seek out sun like a lizard, anywhere I can find it. I do know that my grandmother Nonny and her family came to Sweetwater, Texas from New Mexico. Her eyes were a twinkling blue, her hair a stunning natural silver, and her skin turned a deep olive every summer. She loved being outside in her garden, always in a flower print dress (I never saw her in slacks), and if we grandkids were lucky, she’d see and catch a baby horned toad, which us we loved to hold and play with more than any store-bought toy. But I digress. Back to the pool. 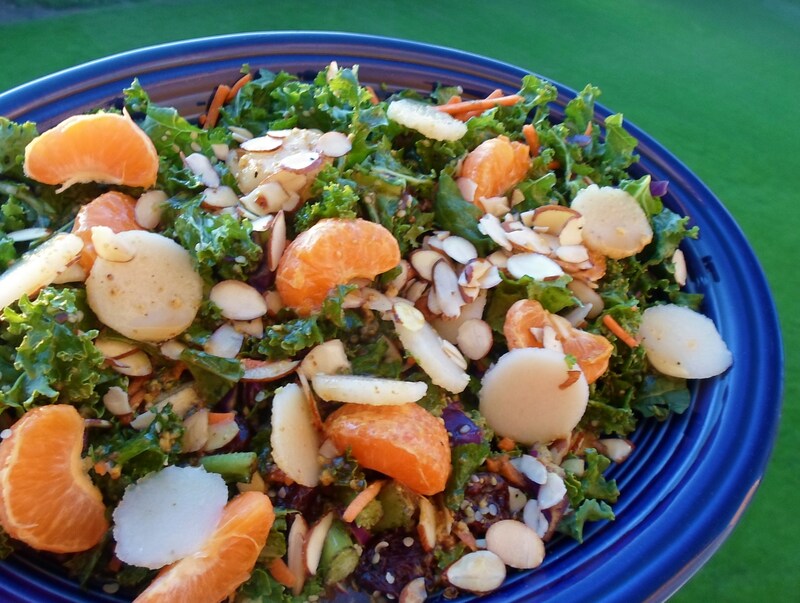 When I could see the sun dipping in the sky, I jumped out of the lounge chair, hurried back to the condo, grabbing this and that from boxes of food stuffs and ice chest we brought from home – kale, dried cherries, hemp seed, sliced almonds, Clementine oranges – quickly creating the world’s fastest salad. Then photographing it while there was still natural light on the patio overlooking an emerald green golf course. After two days of road trip food burgers and fries, my body was craving something green and healthy. 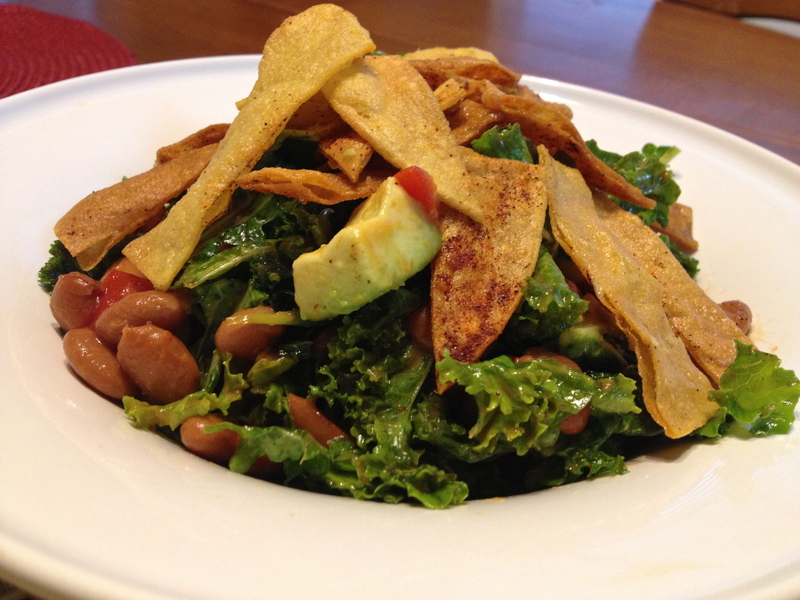 This is truly a Super Salad, loaded with nutrition – and it was soo yummy, I know I’ll be making it again and again. 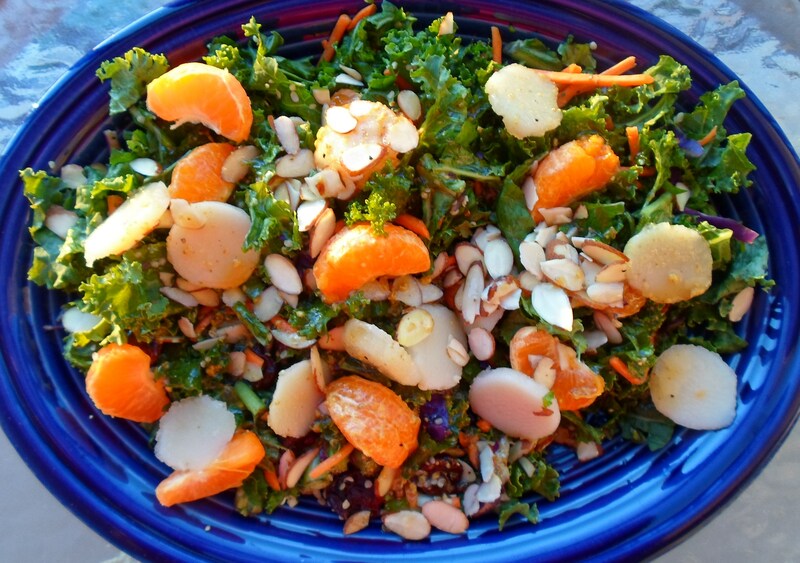 The nice thing about using kale in salads is that the salad still has lots of chew and crunch the next day, and in fact, it seems to get even better as it has time to sit and soften a bit in the dressing. 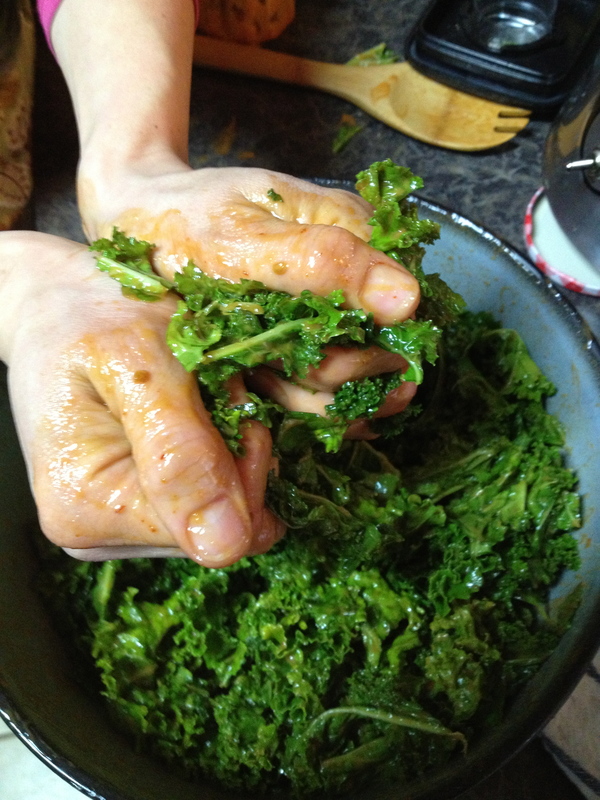 Put kale in a large bowl and knead and massage it with clean hands for a minute. This will break down the fibers and make the kale tender enough to eat raw. (Sometimes I run hot water over it in a colander to soften the kale first, knead it, and then rinse again in cold water.) Add all the rest of the ingredients for a salad and serve in a pretty flat platter. Whisk all the ingredients for the dressing together and drizzle over the salad. Serve and enjoy.